A Look at The Walking Dead- Season 4, Episode 14: “The Grove” | What Else is on Now? Whatever happened to predictability? The walkers? Living rooms? Evening TV? You miss your old, familiar friends, but waiting just around the bend…are smoldering walkers. This week’s “The Grove” took a darker turn than past episodes. Like before, part of the focus went to this group heading toward Terminus, but the bulk of the plot focused on character interaction and growth in an apocalyptic world. What sounds like just another episode of characters walking toward and talking about Terminus turned into something much more brutal. Again, not Game of Thrones brutal, but hey, baby steps. 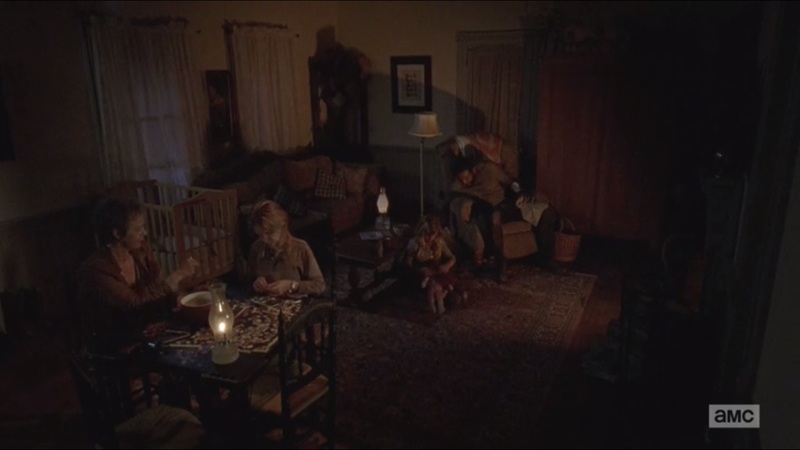 Anyway, the episode begins proper at night with Lizzie and Carol being the only two still awake. Despite Carol insisting that she go to sleep, Lizzie is confident that she can help Carol. 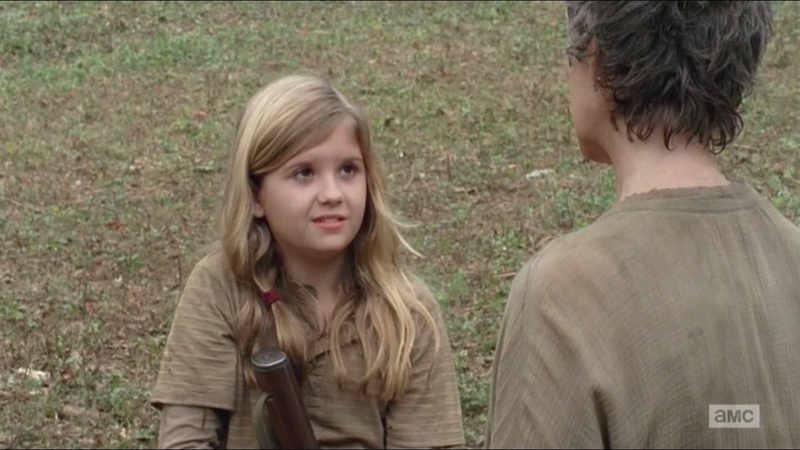 Lizzie wonders if there will be other children at Terminus. Maybe, if their parents kept them safe. But, then again, Lizzie talks of the people she killed during the Governor’s assault, so it’s just as possible that kids kept their parents safe. 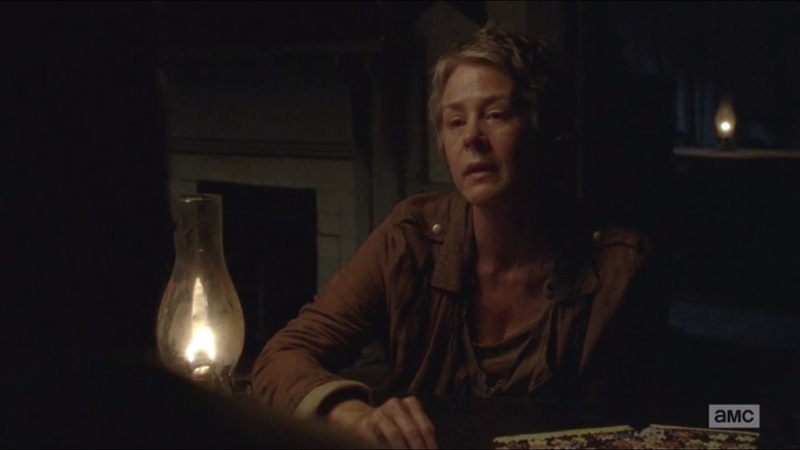 After a brief callback to Sophia, Carol orders Lizzie to sleep, just as the two overhear Tyreese talking in his sleep. 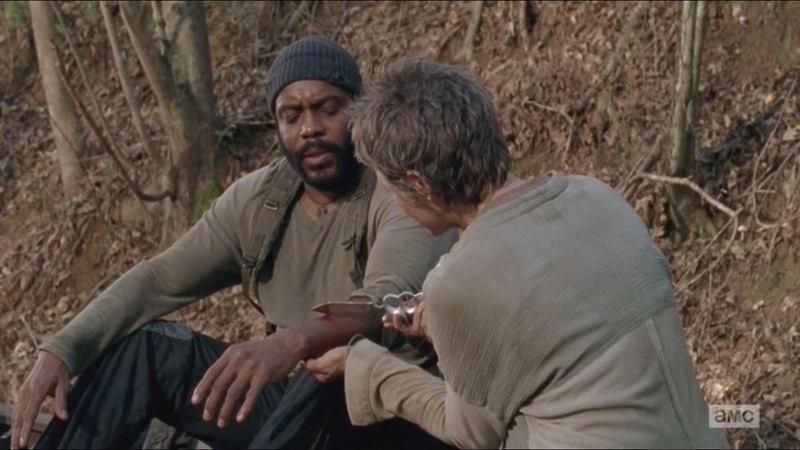 The next morning, Carol applies some tree sap to Tyreese’s arm wound. As the group walks, still unsure on how far away Terminus is, we see the key differences- again- between Lizzie and Mika: Lizzie believes that walkers are just different from humans, but Mika doesn’t have a mean bone in her body. It’d take a lot for her to kill. 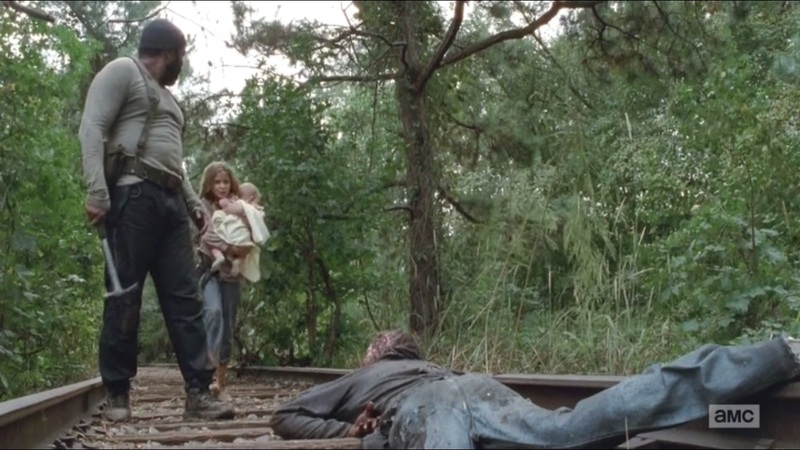 As the group continues along, they contemplate stopping to find some water, but before they can get far, Lizzie and Tyreese spot a walker coming along on the railroad tracks. It doesn’t get very far, though, as it falls between one of the tracks. 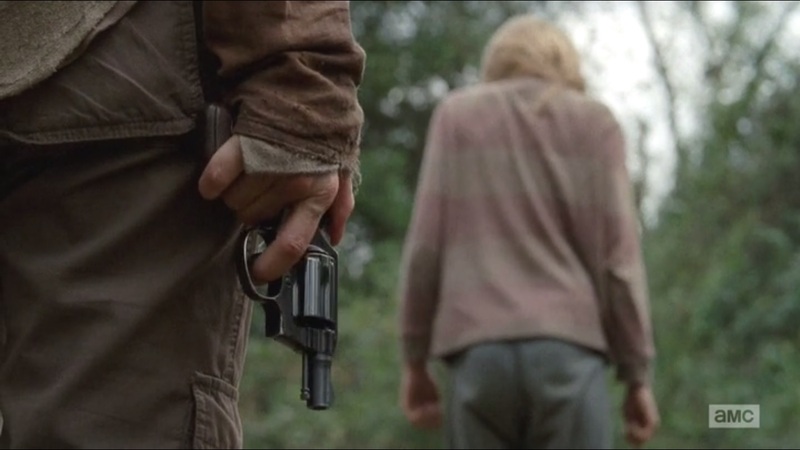 Before Tyreese can kill it, Lizzie stops him, telling him that sometimes they don’t have to kill walkers. Carol, meanwhile, delivers a grave warning to Mika: she’s little and sweet, both of which can get her killed. Mika’s convinced that she doesn’t have to be tough since she can run. As much as Mika would like to toughen up, she can’t bring herself to kill, even if walkers are already considered dead. She doesn’t want to kill people who want to bring her harm. Rather, she feels sorry for them because she’s convinced that they weren’t like that. This girl, ever the optimist. But Carol persists. Mika will have to change sooner or later. Things don’t just work out. As she says this, the two approach a clearing with a few homes ripe for the housing. Well, that worked out. 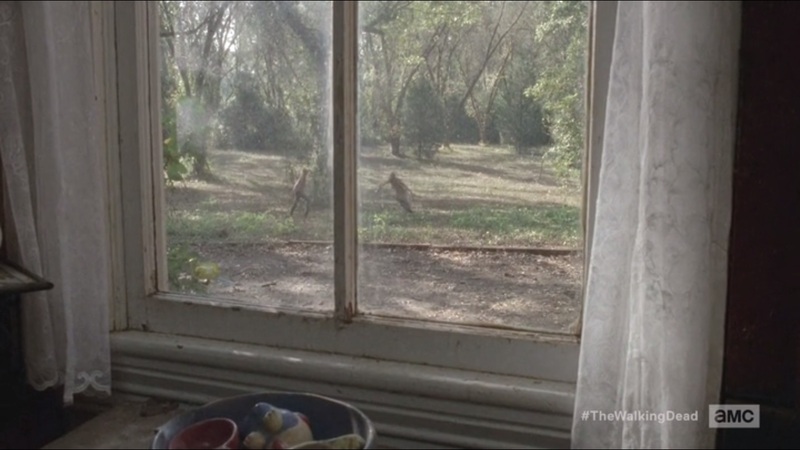 Carol and Tyreese enter one home and order the girls to remain outside with Judith, no matter what. Soon enough, one walker stumbles out. Lizzie’s too shocked to do anything, for some reason, so Mika, after three shots, is able to down it. That evening, Lizzie is still shook up over almost being killed. She still doesn’t fully grasp what happened, but she’s trying to. While everyone settles into the home, Tyreese just can’t help but find it odd that they’re actually in a living room in a house. It feels too hard to believe, but Mika, ever the optimist, just tells Tyreese to relax. The place is so comfortable, maybe they don’t even have to go to Terminus. They could just live there. The next morning, Carol sets a kettle on the stove and we get a payoff to the show’s cold opening, as it turns out Lizzie was the girl playing the walker. 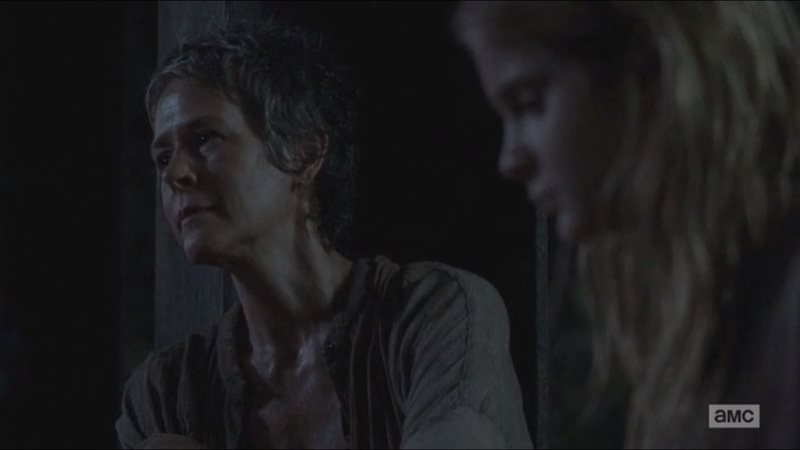 Carol, like most sane people would, rushes out and kills the walker, which sends Lizzie into a frenzy. She lashes out at Carol for killing her friend. She didn’t have to do that! That was her friend! It’s the exact same thing as Carol plunging the knife into Lizzie! Anyway, Carol heads off to teach Mika how to hunt. Already doesn’t seem promising, given how Mika never liked dissecting in science class. They spot a lone deer and, after a moment’s hesitation, Mika just can’t bring herself to shoot it. But hey, they’ve got peaches. Peaches! Back at the grove, while Carol and Tyreese consider the idea of staying there, Mika spots Lizzie heading off by herself and gives chase. 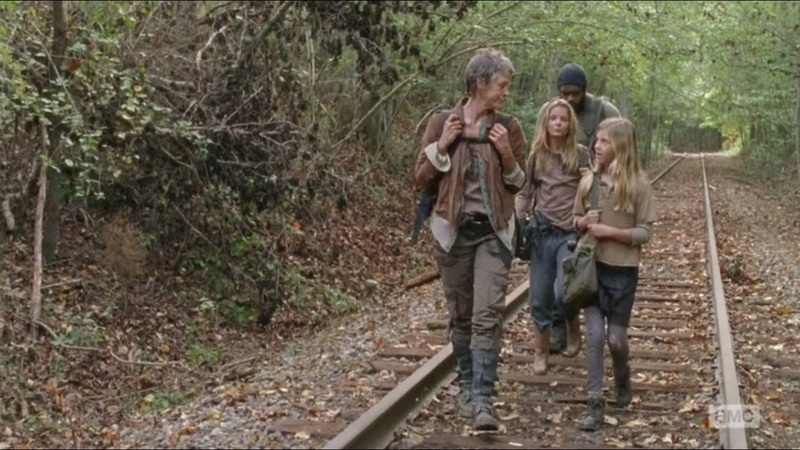 She finds Lizzie heading back to the train tracks to give a rat to the walker stuck in the tracks. Mika is convinced that the walkers are bad, but Lizzie insists that she can hear them. They want her to be like them. She then holds out her hand and approaches the walker so she can be just like it, but before anything can happen, smoldering walkers emerge from the woods and converge on the grove. Though Mika gets caught, she’s soon freed and the four soon down every walker. Not exactly sure why, given how the walkers could just get caught in the barbed wire, but whatever. Carol is still trying to make sure Lizzie understands what walkers are, even though, you know, she knew that before and is having this sudden switch. Mika, though, admits that sometimes she may have to be mean and kill people, even though she doesn’t want to. Later on, Carol entertains the idea of staying at the grove, though Tyreese admits that it doesn’t mean they have to stay forever. For now, he just isn’t ready to be around other people. He’s also been having dreams about Karen. Sometimes he sees her in a crowd before the world went to hell, but then he sees a stranger kill her. The memory still haunts him. Carol counters that maybe the dead aren’t haunting him, but teaching him that people have to live with decisions they make, even if they’re bad. The two return and find Lizzie standing and waiting for them. With a bloody knife. And Judith sitting on a blanket nearby. Oh, and a dead Mika. What the actual hell? 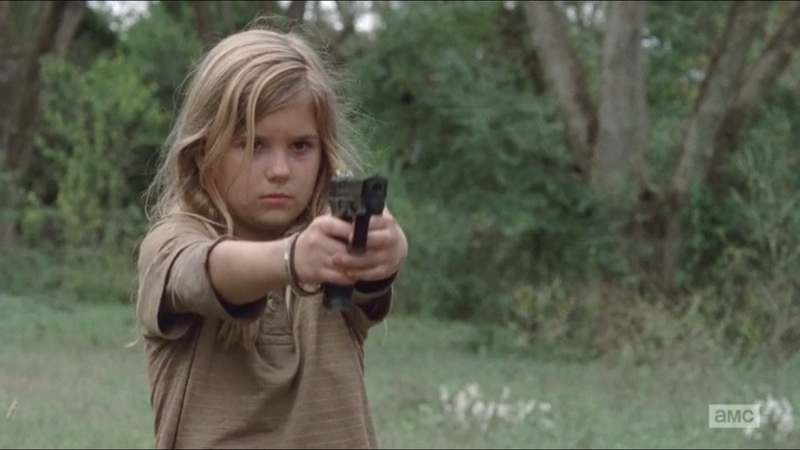 Lizzie, gun drawn, insists that they want for Mika to turn, but Carol wants Lizzie to turn over the gun first. Carol then promises to tie Mika up so she can’t get away. When Tyreese manages to get Lizzie far away, Carol does what needs to be done and finishes off Mika. 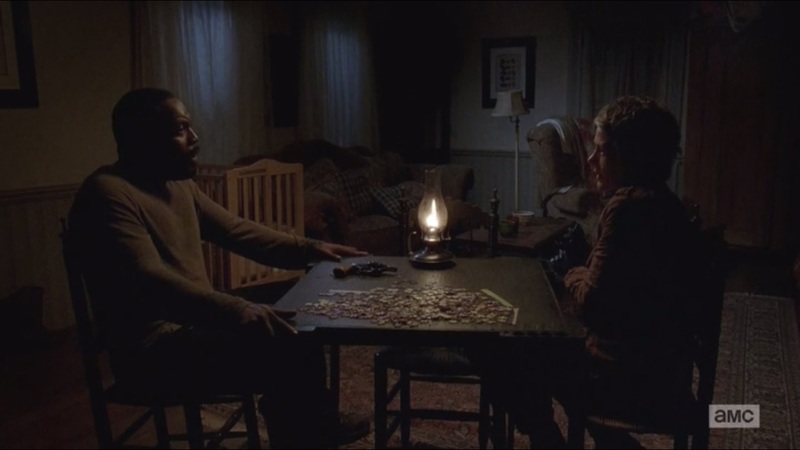 After this, Tyreese tells Carol that he cleared Lizzie’s room of any sharp objects. Turns out that Lizzie also had a shoebox full of mice, painting her as the one responsible for feeding walkers back at the prison. Tyreese figures that this means Lizzie is the one who could have killed Karen and David, but Carol states that Lizzie would have just let them turn. And really, given Lizzie’s small body, I don’t see how she could have accomplished that. 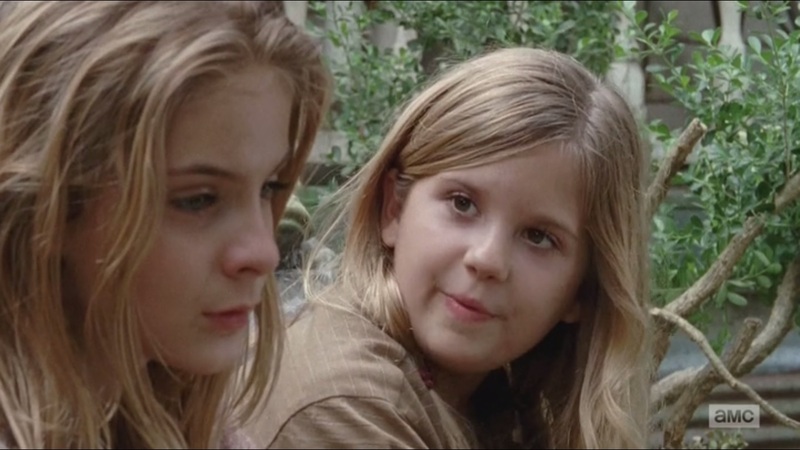 The two already figure that Lizzie won’t be anywhere near Judith. Heck, it’s not even safe anymore to stay under the same roof with her, anyway. So Carol takes Lizzie out behind the woodshed-I mean takes Lizzie out to pick some wild flowers. Lizzie notices that the fire is dying down, but she begins to sob about what she did to Mika and how much she doesn’t want Carol to be angry at her. 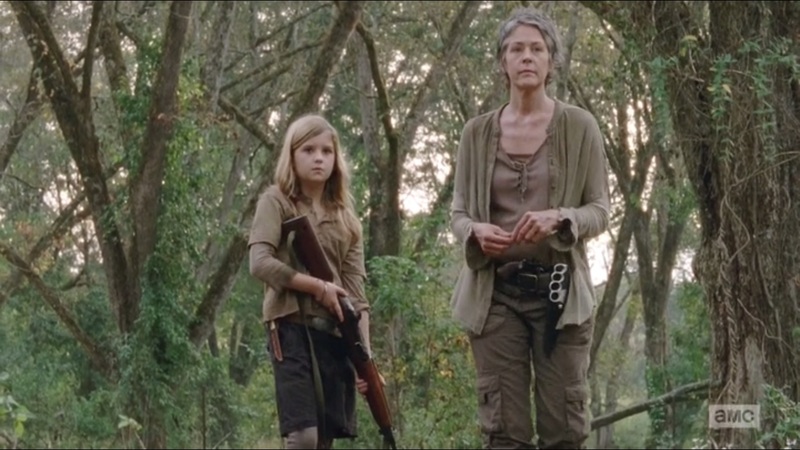 As Lizzie continues forward, Carol draws her gun and simply tells Lizzie to look at the flowers. That evening, Carol finally admits to Tyreese that she killed Karen and David in order to keep the virus from breaking out. With her gun on the table, Carol tells Tyreese to do whatever he has to do. Rather than lash out, Tyreese asks if Karen went quick, which she did. 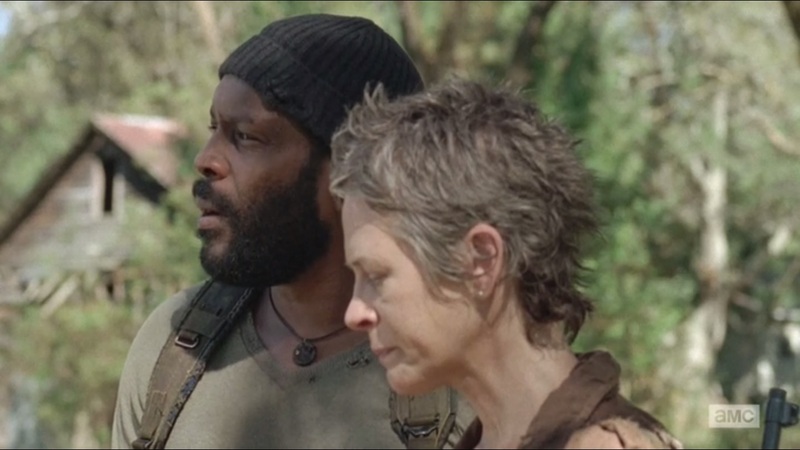 In a move that surprised me, Tyreese doesn’t get angry or lose his temper, but forgives Carol. Now, he won’t forget it and I doubt he’ll let her forget it, either, but given how much Carol has had to shoulder, Tyreese knows that Carol is going to feel the weight of those murders for the rest of her life. What she did is a part of her. And with that, there’s no longer a reason to stay, so Tyreese, Carol and Judith leave the grove and head toward Terminus. Hot damn, that was a change of pace. This episode, along with “Inmates” and its early introduction of Abraham, Eugene and Rosita, went against my expectations for how the second half of Season 4 would play out. I expected each episode would deal with one or several groups from the prison, their struggle for survival and their eventual reunion just in time to meet the three newcomers. “The Grove” was more than just this group thinking about and heading toward Terminus. It felt like plunging a knife into your gut, twice, and twisting it just to give you that extra jolt of a reaction. The writer of this episode, Scott Gimple, also wrote the well done “Clear,” which focused on Rick, Carl and Michonne finding Morgan. Like that episode, “The Grove” never strays to another storyline. It’s contained, and it needed to be in order to make these scenes more powerful. If the episode had cut away to, say, Rick’s group, now, it would just confuse the issue and lessened the impact felt from what Tyreese and Carol witnessed and had to do. At the end of the day, all of the other groups have characters that we’ve had a chance to connect to, especially Beth, given how we’ve known her since Season 2. So we as an audience have connections to the other groups, while Lizzie and Mika, as still relative newcomers, still had to forge theirs. And did they ever! Before getting to the actual characters themselves, I just want to comment on how deceptive this episode was: it started off nice and calm with a familiar image of a well stocked kitchen, some nice music playing in the background- all very innocent set pieces. And then, boom, you see a girl outside playing tag with what looks to be a slow girl until you realize she’s playing with a walker. It hooked me from the start and made me wonder just what in the hell was going on, only to find out later that the girl was Lizzie. The episode took a more serious tone than, I think, “Still” and “Alone” did. Both of those episodes had their serious scenes and moments for character development, but they also took the time to lighten up, such as Beth and Daryl finding the white trash brunch or Bob always being the optimist. Here, the episode took a hard right and was always serious. The tonal shift didn’t feel awkward or out of place. In fact, I’d argue it was necessary. Seeing Beth and Daryl give the finger to the burning building or Bob, Sasha and Maggie hug when they reunite gave us happy moments that provide a sense of hope that the zombie apocalypse won’t always be bleak and full of tragedy. But then you remember that these characters do live in a zombie apocalypse where things can be bleak and full of tragedy. One of the main points I grasped from this episode is that, ultimately, no one, not even children, is safe. It dealt with morality and had both viewers and the characters question if murder, even in the worst case scenarios, is the best decision. While Tyreese and Carol seem to agree that it is, that doesn’t mean it isn’t ugly, and this is best exemplified via Carol, whose having to shoulder more and more burdens that would take a toll on most people, but she’s been able to weather it all and keep on pushing forward. Carol saw Sophia as a walker. She knows the world she lives in and what it can do to the people she loves. -because Mika wouldn’t do that, and it’s what made her being so idealistic and optimistic, in addition to not wanting to kill, and a prime target for death. And it’s what put Carol at odds with Rick in the first place. Yes, like Rick said, Karen and David might have lived, but Carol wasn’t willing to take that chance. Surely Carol can’t fully believe that what she’s doing is right, but she believes she’s doing it for a greater good. The ends justify the means, no matter how horrific. “The Grove” put a twist on how previous groups have reacted when finding homes they could potentially inhabit. With Beth and Daryl or Rick and Carl, both groups found places that seemed homely and fit enough to stay in, but each time, outside forces put them out and on the move toward Terminus. 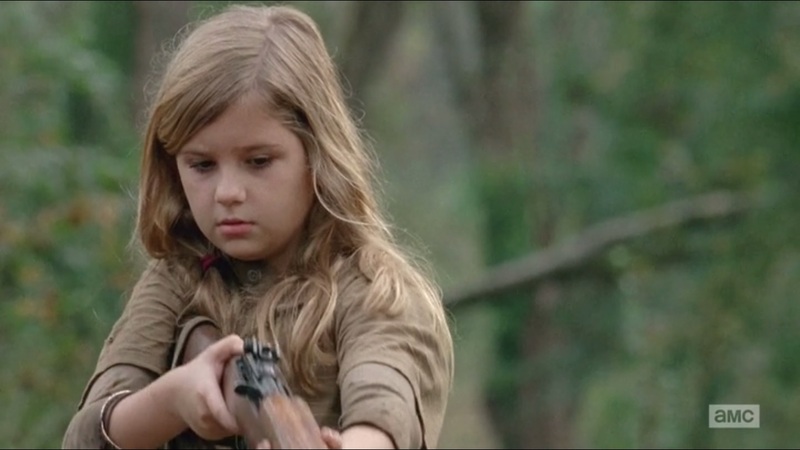 But this time, it’s Lizzie’s actions that ultimately forced Tyreese, Carol and Judith out of the grove. And like Daryl sleeping in the coffin because it was comfortable, Tyreese not knowing how to initially react to being in a living room with a fire showed how much the world has changed for these people. The simplest pleasures that we take for granted now seem like rarities and luxuries to them. From the start, it’s clear that something wasn’t right with either Lizzie or Mika. Back during “30 Days Without an Accident,” Mika told Carol that Lizzie was just a little missed up. I said before that Lizzie came off as more seasoned due to her age, but this episode proved that her mindset isn’t as sharp as I gave it credit for. It’s strange that Lizzie, who chastised Mika for being afraid, would suddenly become shell-shocked when a lone walker approached her. She lived through the Governor’s assault and saw her fair share of evil, both in walkers and other humans. I figured, given what we learned about her already, that she’d be ready to defend herself at all times, but she’s still a child. This world still scares her. And it’s easy to see how this would mess with her head to the point that she’d feed walkers and almost allow herself to get bitten. For Lizzie to believe that walkers can be loved shows that she just wouldn’t make it in this world. At least the Governor had enough sense to keep his daughter restrained. 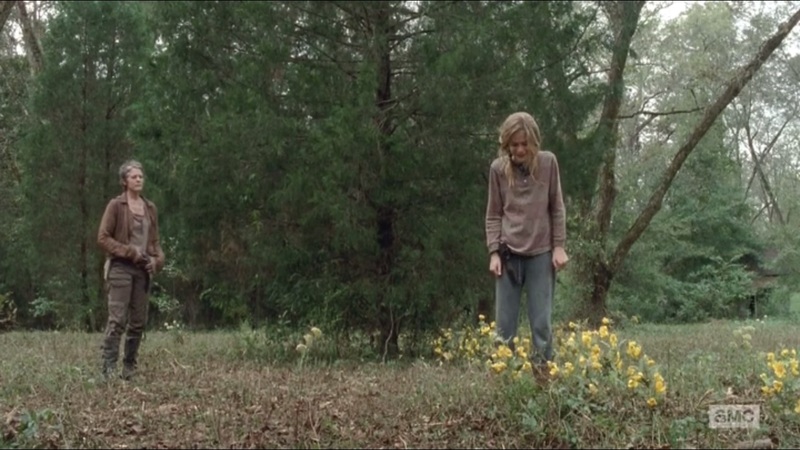 Here, Lizzie is playing in the open with a walker that could have easily scratched or bitten her, and when Carol kills it, the girl goes on a near psychotic breakdown. It’s maddening, but it just shows how far off the deep end Lizzie has gone and how she’s trying to skew the rules of the world she’s living in. Seeing her stand over Mika’s body with a bloody knife with Judith watching was a haunting image. She feels that she’s done the right thing, murdering her sister just to prove that she can be loved both as a human and a walker, but it’s not until she’s about to meet her own end that she wishes that Carol not be angry with her. If the show wanted to give us a reason to care about Lizzie, there it is. Just sad that it had to come at the expense of her sanity and Mika’s life. Speaking of Mika, I did find her a bit charming this week with her wanting to hold onto her innocence. Whether it was her being unable to shoot the deer or feeling sorry for people who are evil on the grounds that they weren’t always that way, Mika won’t allow herself to go down the dark path that someone like Carl already walks. Mika isn’t putting herself above killers, but she does try to see the good in everything, such as when she tells Carol that they can have peaches in lieu of deer. When Mika tells Carol that she can run instead of being tough, you get the feeling that she’s being a bit too naïve. She’s got to know that, sooner or later, she’ll have to kill in order to survive, and she does just that. 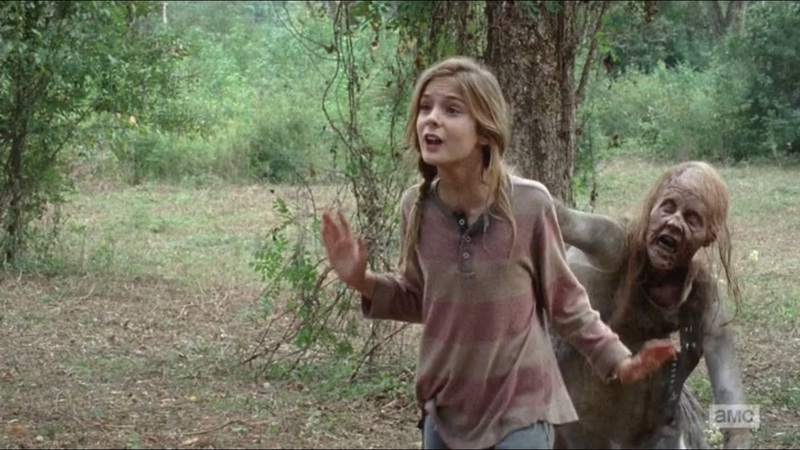 She’s a little girl, but she’s not stupid, so it was satisfying for her to tell Lizzie that walkers are bad. This brings up my only qualm with these two characters: their personalities seemed a bit too inconsistent. It’s because this episode focused exclusively on one group that the shifts seemed all the more glaring. Now I know character inconsistencies are nothing new for dramas, but it was more obvious in this episode. During “Inmates,” Lizzie once chastised Mika for being afraid and not being as strong as Sasha, but now she hesitates at the sight of one walker she could have killed and plays tag with one like it was her best friend. More than that, she told Tyreese that a walker unable to move didn’t have to be killed. Say what? And while for Mika, it could be a case of her growing up, for her to say that she doesn’t want to kill, but then tell Lizzie that walkers are bad just felt contradictory. And when the smoldering walkers attacked, she was more than willing to pick up a gun and shoot to kill. I’m not a television writer, but the girls should at least be resolute in their respective stances on walkers, not waiver when attacked. But since both of the girls are dead, it probably won’t be such a big deal anymore. All right, time for the comparisons. A lot of people have drawn parallels between Lizzie and Mika to Billy and Ben from the comic, and it’s easy to see why. Both had adoptive parents, though in this case, the parental roles are reversed. 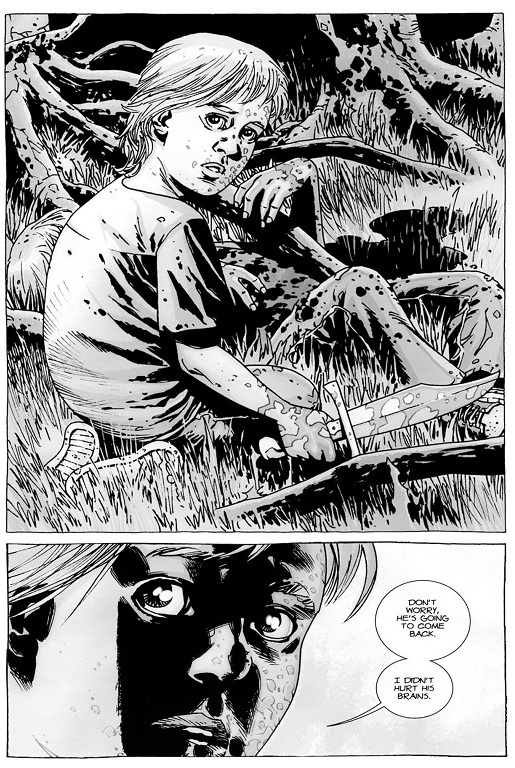 In the comic, Dale and Andrea adopted the boys and Carol was already dead. Here, it’s the other way around. Also, Ben kills Billy and told Andrea not to worry because Billy would come back. Both involve children committing murders they don’t fully understand and both Ben and Lizzie paid with their lives. It’s a nice way to adapt that particular plot. However, one difference is that we see early on how much it pained Carol to kill Lizzie, whereas in the comic, Carl didn’t feel much remorse for killing Ben until he confessed to Rick much later. Tyreese really has come a long way since his brawl with Rick over finding Karen and David’s bodies. He hasn’t had to make the same tough decisions that Carol has, but he’s still a part of it because he knows it needed to be done. Again, it wasn’t right, but necessary because Lizzie posed a potential threat to the group. I enjoyed his moment when he couldn’t grasp the idea of being in a comfortable living room because it shows how detached everyone is from their former lives. What seemed normal before now just feels out of place. Like Daryl, Tyreese entertaining the idea of staying put at the grove showed his desire to just be comfortable for the time being. It may have meant more time apart from the rest of the group, but he would have been somewhere that came the closest to resembling an actual home. We all knew Tyreese and Carol would eventually talk about Karen and David, just not when or how. It’s clever timing on Carol’s part. I’m inclined to agree with the perspective taken by Matt Fowler of IGN on this episode, where if Carol had admitted this back when Tyreese first talked about seeing Karen in his dreams, he probably would have killed her. Or at least blown up about it. On first viewing, I called foul on Tyreese easily forgiving Carol for what she did. After all, he became incensed at Rick when they first found the bodies, resulting in their bloody fight, and it was clear he was out for blood. It felt too simple for him to just forgive Carol like that, but really, Carol just killed one potentially psychotic girl who murdered her sister in cold blood. They’ve got enough on their plate and I doubt Tyreese would want to push things any further. Though I did like when he told Carol that, while he forgave her, he wouldn’t forget, and neither will she, because she even though Karen and David went easily, she still murdered two people who, as Rick said, might have lived. That sort of thing will stay with her for the rest of her days. And I really feel bad for Carol, who has to make the worst case decisions and shoulder so many burdens that you can see the toll the murders take just from her facial expressions. 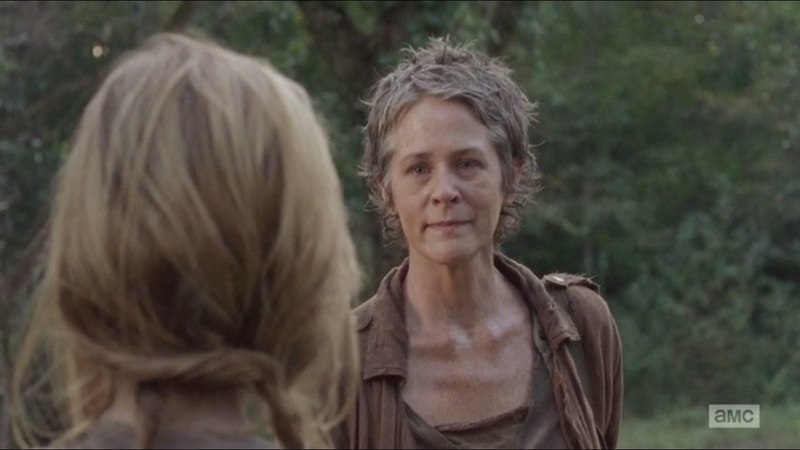 Melissa McBride really does turn in an excellent performance this week. She’s the supportive mother who has seen the ugliness around her and wants what’s best for her newly adopted kids. The murders have hardened Carol, but she hasn’t lost her sense of self yet. She can be stern, but just as supportive as she always has been. Whether telling Lizzie and Mika about Tom Sawyer or joking about Ed, Carol can still show her human side. Those moments are just as integral to maintaining her humanity as teaching Mika to shoot and telling her to toughen up are integral to survival. And given how Carol had to deal with an abusive husband, she knows all about survival even before walkers claimed her daughter. 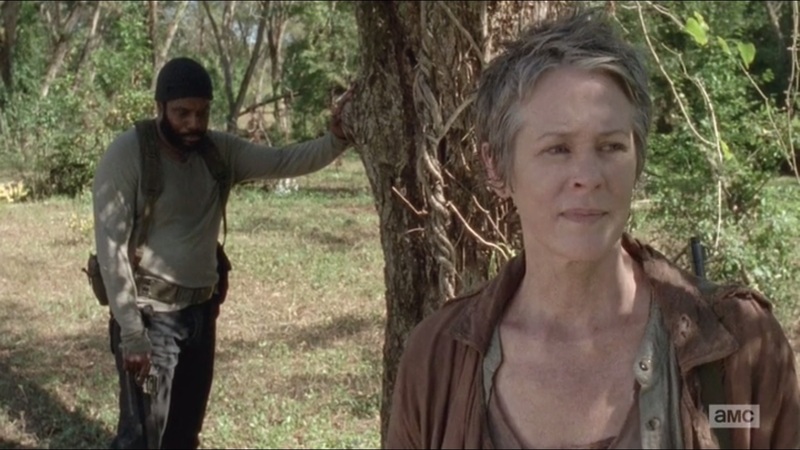 Carol has a lot bearing on her heart, but she’s able to keep it all contained very well, despite the obvious outrage seen on both her and Tyreese’s face when they find out that Lizzie killed Mika. Side-note, what in the world made these two think it was good idea to leave Lizzie, Mika and Judith alone? 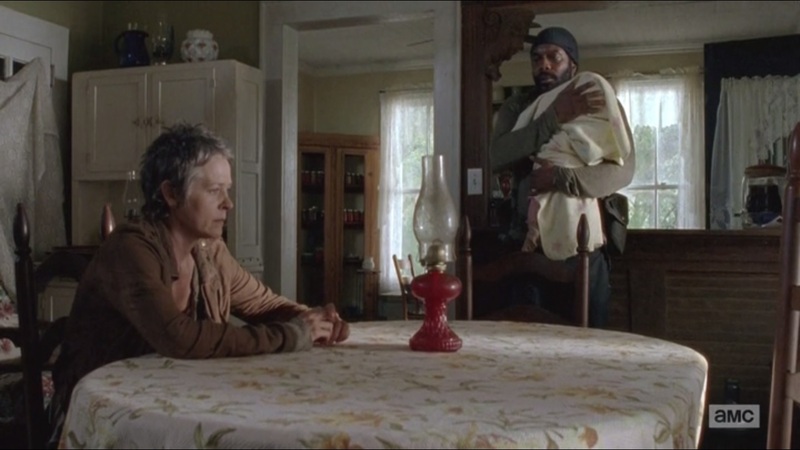 I know Tyreese did the same thing earlier, but I’d think he and Carol would have learned not to leave three girls alone, even if they appear to be in a safe haven. But anyway, Carol has seen her fair share of horrors. She killed Karen and David, at first, without any remorse, but she is still not a monster. This is exemplified most when we see the anguish when she tells Lizzie to look at the flowers before shooting her. It was tough call to make, but it had to be done, similar to Rick shooting Sophia or Carl killing Lori. These kinds of calls stick with you. Yes, there’s the obvious parallel to Of Mice and Men, but it pained Carol even more when Lizzie begged Carol to not be angry at her. It was a mercy killing. It was a strong scene helped by a strong performance by McBride, because the child acting, while not terrible, still isn’t all that great. “The Grove” showed that there’s no easy way out in this world. Like previous episodes, this one put the group on the track toward Terminus, but unlike last week, we saw how bleak the world can be and is for everyone, child or adult. 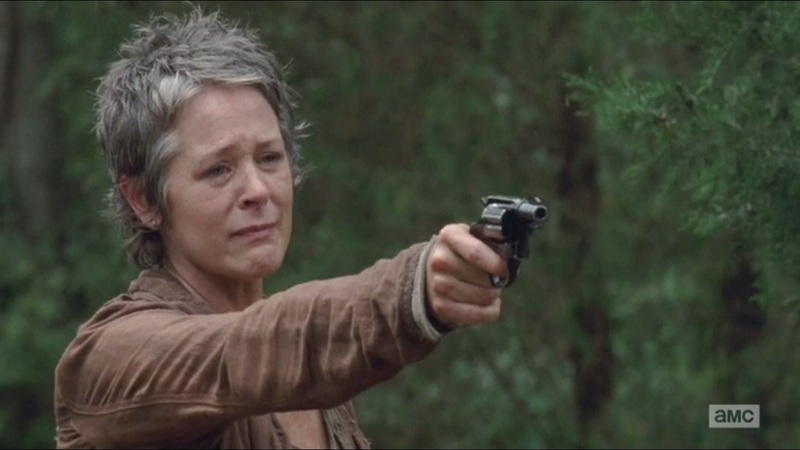 Mika told Carol that she wasn’t afraid to kill, just afraid. This, coupled with an unhinged Lizzie, showed that these girls just did not the survival instinct and, if left alone, would have left them vulnerable to the walkers. Carol and Tyreese had the chance to bear their souls to each other, but now they have even greater burdens to bear. The episode had us question what we would do if we’re called to kill. Do we walk away from a murder as the same person or does it start you down a dark path? Should we feel remorse for those who try to kill? Do you commit a necessary, but morally questionable evil for a greater good? What would you do? This entry was posted in The Walking Dead and tagged Alanna Masterson, AMC, Andrew Lincoln, Ben, Beth Greene, Billy, Bob Stookey, Brighton Sharbino, Carol Peletier, Chad L. Coleman, Christian Serratos, comic book, Danai Gurira, Daryl Dixon, Dr. Eugene Porter, Emily Kinney, Glenn Rhee, Josh McDermitt, Kyla Kenedy, Lauren Cohan, Lawrence Gilliard Jr., Lizzie Samuels, Maggie Greene, Melissa McBride, Michael Cudlitz, Mika Samuels, Norman Reedus, Rick Grimes, Rosita Espinosa, Sasha, Sergeant Abraham Ford, Sonequa Martin-Green, Steven Yeun, Tara Chambler, The Walking Dead, Tyreese, zombies by omarid513. Bookmark the permalink. Great post. There really is so much to say about this episode. I think the inconsistency in Mika and Lizzie comes from their different views of humanity and walkers perhaps as well, as glaring as it was; for instance, Lizzie is strong but I think she’d be more willing to stand up for herself in the face of human danger than Mika, who is weaker but would more readily kill walkers than humans. The fact that there are so many dimensions to the dangers that face them causes this kind of multi-faceted world view that the two girls ebb and flow between and within, perhaps. I really thought the writing and acting all around in this episode was particularly affecting, like you pointed out as well, definitely a nice change of pace, and one of the more effectively thought-provoking morality plays of the series, I think. I also love how much Carol has changed over the seasons as a result of all these things she’s had to go through and the decisions she has made. I was also expecting Tyrese to react more than he did but in a way, I think it fit with the events of the episode that he forgave her with self-restraint and understanding– these people definitely don’t get to come away from these experiences, and that seems to be one of the more crucial themes of the show as it gets further into the seasons.